The NH Lakes Region city of Laconia, NH was first explored in the 1620’s. Laconia was, for many years, a part of Meredith and Gilford known as Meredith Bridge. Early explorers had hoped to follow the Piscataqua River north to Lake Champlain, in search of the great lakes and rivers of Canada told of in Indian lore. These explorers were known as the Laconia Adventurers, Laconia is also a region of ancient Greece. Laconia, New Hampshire was Incorporated as a city in 1893. Laconia includes the villages of Lakeport and Weirs Beach. Weirs is the name of primitive fishing devices discovered at the outlet of Lake Winnipesaukee. Native Americans captured fish swimming out of Lake Winnipesaukee and into Paugus Bay with netting, called Weirs. 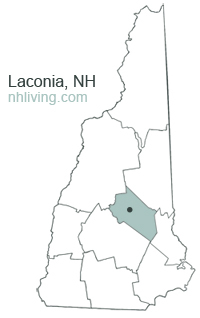 To share any Laconia, NH information with us, contact us. Learn more about advertising in NHLiving.